And yes of course I did celebrate Valentine’s day with my hubby… But thanks to his very busy schedule (I am not complaining as he is busy cos he is getting done with his PhD dissertation), we had to have a very low profile celebration today… But we did not skim on the chocolates and wine. I made a pepper garlic chicken dish which I will post in due time and have marinated some lamb for some delicious lamb biryani for tomorrow. These recipes are all getting ready to be posted once this post is done. The Daring Cooks’ February 2012 challenge was hosted by Audax & Lis and they chose to present Patties for their ease of construction, ingredients and deliciousness! We were given several recipes, and learned the different types of binders and cooking methods to produce our own tasty patties! Valentine’s day happens to be the reveal date for the daring cooks challenge for Feb 2012. I have made these before but for this challenge I decided to make two types of patties which I haven’t tried before. One is a spiced mint lamb patties and the other one is a combination of rice and shrimp. I love patties mainly cos they are delicious and secondly, you can convert just about anything in patties and make a while new dish without a lot of effort. Mix together all the ingredients by hand. Once the ingredients are thoroughly mixed together form patties. To ensure that the patties are all the same size, use a measuring cup to measure out each patty. 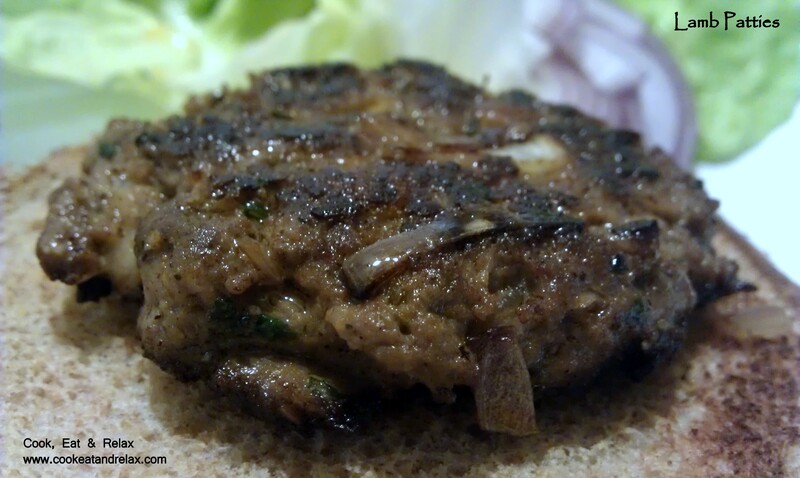 I used 1/3 cup for one patty but I would recommend using about 1/2 cup meat to form a single patty as the red meat patties to shrink quite a bit when they are cooked. Also form a depression in the middle of the patty before frying it as these patties do tend to puff out in the middle as they cook. It works best if you can cool the patties for some time in the refrigerator as it helps firm up the patties and avoids breaking and cracking of the patties. Once they are firm enough add just a touch of oil to a non stick pan and transfer the patties to the pan. Flip the patties just once when the side on the pan is browned. The patties are ready in about 1o mins. Serve as a burger in a sandwich bun with an onion, lettuce and a yogurt sauce, mixing together about 4 tbsp greek yogurt, 2 tbsp mint chopped leaves, 1/2 tsp dried oregano and salt to taste. These patties are just correctly spiced and are very filling. I did not realize how much they shrink so the bread I got to make burgers with turned out to be too small. But thats a lesson learnt. Hope you enjoy these patties as much as I did. And now for the Rice and Shrimp Patties. Wash and cook the rice in the water-coconut milk mixture. Add the salt and white pepper powder to this before it is cooked. Once cooked, cool the rice. In the meanwhile dry roast the coriander seeds, fenugreek seeds, curry leaves and the black pepper. Transfer the roasted seeds to a grinder and grind to a fine powder. Now marinate the shrimp in the freshly ground spice mix along with the rest of the ingredients. I marinated the shrimp for about half hour. Next heat the oil in a non stick pan and add the cumin seeds. Once the seeds start to sputter add the onions to the oil and fry till they are slightly browned. Next add the marinated shrimp and cook on both sides. This would take about 10-15 mins. Transfer the shrimp to a food processor and grind to a coarse mixture. Add this to the cooked rice along with the coriander leaves and add salt to pepper if required. Next mix the ingredients together with your hand to a sticky consistency. 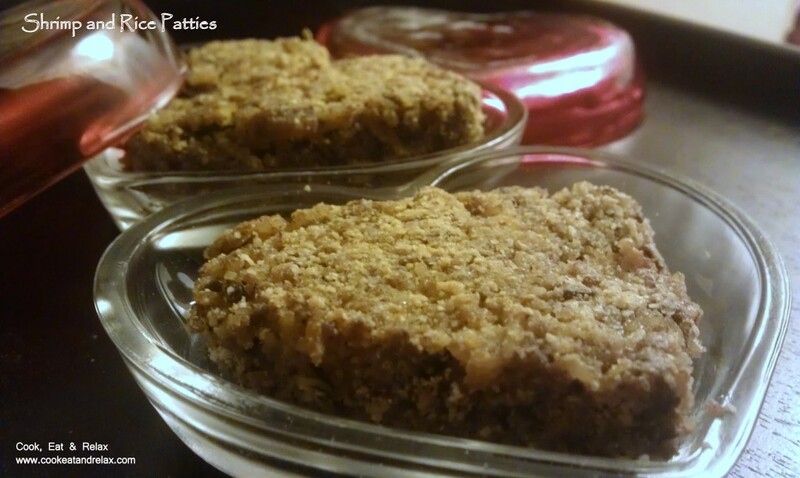 Use the milk and ground oats to ensure that they form patties . Once again use a measuring cup to measure out for each patty. I used a biscuit cutter to get the heart shaped patties. But you can make them simple circular patties. Use the egg as a wash over the patties and roll the patties in the ground oats. (you can substitute this with bread crumbs). Again put the patties in the refrigerator for a while so that they firm up and do not disintegrate when fried. Heat some oil in a non stick pan and transfer the rice and shrimp patties to the pan. Cook for a 3-4 mins on each side till a golden colored crust has formed. The meat is already cooked so you do not have to cook it for too long, just make sure that the crust is a nice golden brown in order to get the slight crunch to the patties. The patties are ready to serve hot just by itself. Since these patties have both rice and shrimp in it they do not require any accompaniment other than some ketchup. Hope you enjoy making both versions of the patties and do let me know if you try out some variations on these patties. I would love to hear about them cos I love to make different kinds of patties. Till the next post, happy valentine’s day everyone! This entry was posted in Appetizers, Main Course, Recipes and tagged daring cooks, lamb, mint, Patties, rice, Shrimp, valentines day. Bookmark the permalink. Some interesting variations. Would love to try that lamb patty with the yogurt sauce! Do let me know hoe you like it once you try it…. Both versions look so delicious the lamb patty is perfectly coloured I love the charring and the shrimp/rice version is so cute. A marvellous effort and result on this challenge. I hope your Valentine’s Day went well for you and your family. Cheers from Audax in Sydney Australia. Thanks for the wonderful challenge Audax…. 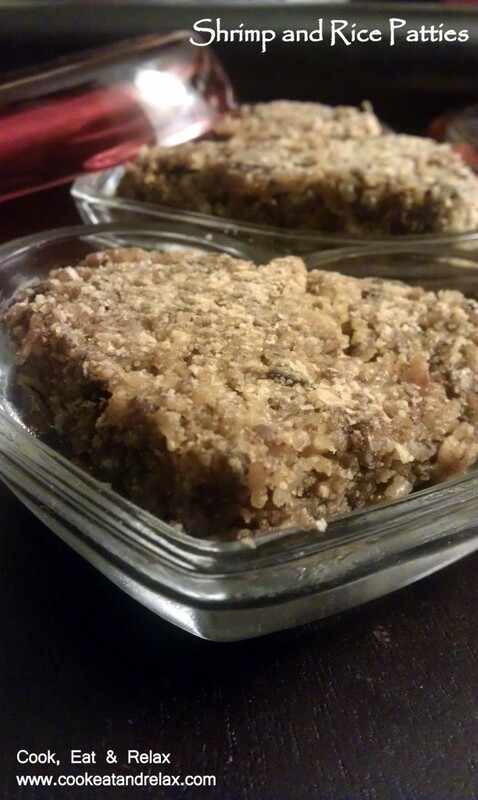 It gave me a chance to try out versions of patties I had not tried before…. they were so delicious that I did not even have enough time to click pictures…. cud not wait… Awesome instructions as usual….